1.33 p.m. R3 12 Salt Bay (3 f Redwood – Marsh Harbour, by Volksraad) – Jake Bayliss; resumed without a trial and patiently ridden she produced a very good performance for fifth in the NZB Insurance Pearl Series Maiden 1230 metres on 13 April at Rotorua. Drawn barrier six in the $10,000 Maiden 3YO 1300 metres, the right trip can see improvement on her first up effort in a field where $2.30 favourite Icebomb (Darci Brahma) will be all the rage. Fixed odds: $15.00 & $3.80. 2.43 p.m. R5 10 Our Showgirl (4 m Ego – Showzeel, by Zabeel) – Jake Bayliss; has finished six lengths behind the winner after working to lead in each of two outings up in grade since winning the Maiden 1300 metres on 1 March at Hastings. 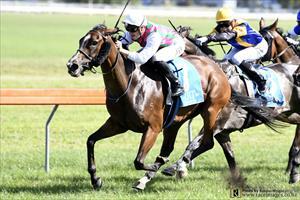 Drawn barrier 11 in the $10,000 Rating 65 1300 metres, she needs things to go her way. Fixed odds: $31.00 & $6.50.